How does blood volume calculator work? How does blood volume affect blood pressure? Our blood volume calculator uses three methods to determine the total blood volume. The first one uses Dr. Nadler's formula, the second one is an equation developed by Dr. Lemmens, Dr. Bernstein, and Dr. Brodsky, and in advanced mode you can find a very simple method that gives a better perspective on the previous two. Preoperative assessment of estimated blood volume (BV) is essential for patients undergoing surgery. It impacts perfusion care, including hemodynamic and pharmacologic interventions, and transfusion practices. Keep on reading to understand how blood volume affects blood pressure. Please note that this is a calculator of blood volume for adults. 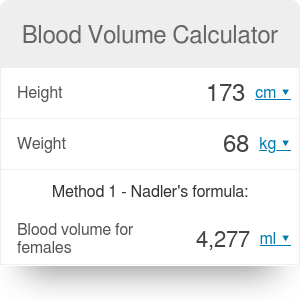 If you want to estimate the blood volume in a child, use our pediatric blood volume calculator. There are several methods available to directly or indirectly measure blood volume, but all are impractical in routine clinical practice. The mean value for indexed blood volume (ᵢBV) in normal weight adults is 70 mL/kg for males and 65 mL/kg for females. You can find the option to calculate it this way in advanced mode. Since ᵢBV decreases in a non-linear manner with increasing weight, this value can't be used for obese and morbidly obese patients. The methods of estimating total blood volume we provide here take into account the entire range of body weights. The dynamic balance between blood volume and blood pressure is regulated by the complex Renin-Angiotensin-Aldosterone system (RAAS) controlled by the kidneys. In normal conditions, it maintains the blood pressure in the range of 90-140 mmHg (systolic BP) and 60-90 mmHg (diastolic BP). Blood Volume Calculator can be embedded on your website to enrich the content you wrote and make it easier for your visitors to understand your message.